« How to deploy REST based web services to Liberty Profile ? WebSphere Liberty Profile is a fast, lightweight and simple Java web application container allowing developer to develop, test and deploy applications easily. In my previous articles, I explained how to install Liberty Profile on Mac and how to develop and deploy your first REST based services. 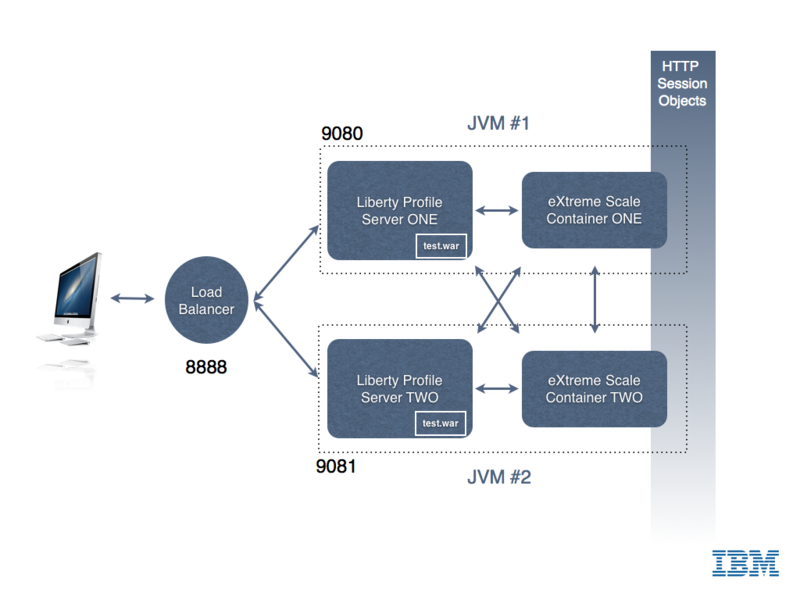 Liberty Profile is a standalone Java container. It is not designed to be included in larger deployments based on WebSphere Application Server ND cells. However, Liberty Profile can take benefit of a shared persistence engine to store HTTP Session data. This allows two or more independent Liberty Profile instances to share a common user session for web applications. When one instance fails, the surviving instances can continue to serve user requests as-is nothing happened. Persistent data store might be a relational database (such as Derby used for development purposes) or a in-memory data grid. In-Memory Data Grid are software solutions providing in-memory data storage, replicated across different containers (or machines). Many IMDG solutions are available from different vendors or in open-source. Most common ones are MemCached, Terracotta (Software AG), Coherence (Oracle) and IBM’s WebSphere eXtreme Scale. If you are totally new to eXtreme Scale, I would recommend to read some basic information about its architecture before continuing to read this article. Configuring WebSphere Application Server (WAS – full profile) to store HTTP Session in a eXtreme Scale container is a matter of three clicks in WAS admin console. It is slightly more complicate with Liberty Profile, just a few configuration steps described below. My final architecture is depicted in the image below. 0. Download and Install Liberty Profile and eXtreme Scale for Liberty Profile (both solutions are available at no charge from IBM – with forum based and peer-to-peer support only). Liberty Profile installation is described in my previous blog entry. cd wlpBLOG sst:wlpBLOG sst$ ./bin/server create ServerONE Server ServerONE created. sst:wlpBLOG sst$ ./bin/server create ServerTWO Server ServerTWO created. 3. Add two features in server.xml for each server. One to tell Liberty to run an XS server embedded. And one to tell Liberty to use XS as HTTP Session store for web applications. Server ServerONE started with process ID 11769.
sst:wlpBLOG sst$ ./bin/server start ServerONE Server ServerONE started with process ID 11769. [AUDIT ] CWWKF0011I: The server ServerONE is ready to run a smarter planet. Congrats, you have your first instance up and running, let’s now configure a second instance. You should see a page similar to the one shown at step 9 above. Try to alternatively reload the page from ServerONE and the page from ServerTWO : you should see the session counter to increase in a sequence across the two server instances. You’ve just created your first Liberty Profile cluster with two instances and a shared in-memory grid for HTTP session storage. I leave you as an exercise to install and configure a load balancer in front of these two instances. Hint : I am using the open-source balance for demo / test purpose. If you find errors / typos in this (long) article, let me know – I will fix them – Thanks ! This entry was posted on 14/10/2012, 15:48 and is filed under IBM, Java, Mac OS X. You can follow any responses to this entry through RSS 2.0. You can leave a response, or trackback from your own site. How to deploy REST based web services to Liberty Profile ?